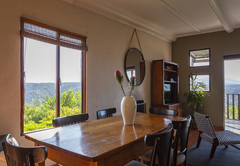 Forest Valley Cottages is a highly recommended property providing self catering in Knysna for tourists visiting the Garden Route region. 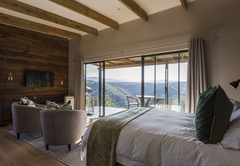 Beaming with casual luxury, Forest Valley embraces the dramatic beauty of the coastline town of Knysna with mountain and forest views. 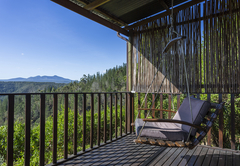 The offer of tree-top casual, rustic, honeymoon hideaways, cocooned seclusion and stunning views of deep indigenous forest valleys and mountains. 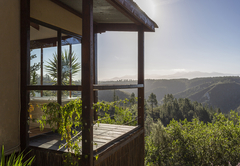 7mins from the Knysna lagoon then drive around this scenic natural icon to Knysna town. 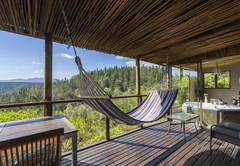 The tree-top units, Wild Iris, Glory Dawn and Sandstone are all stylishly and individually furnished with a natural contemporary feel. 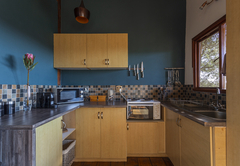 Air Con cooler/heating is available in these units. 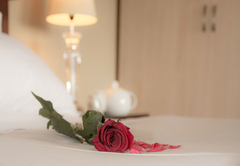 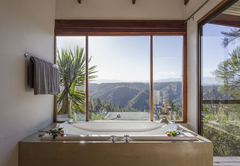 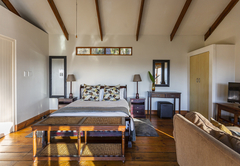 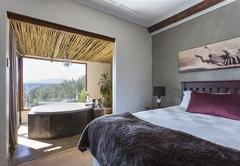 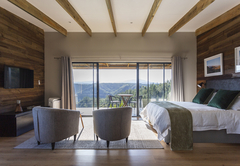 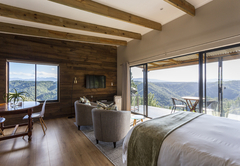 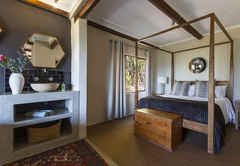 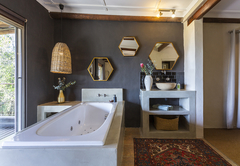 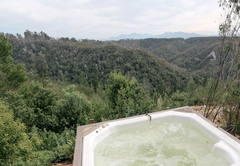 Each have a plush Queen-size bed with quality linens; a Jacuzzi / spa bath opens to the gorgeous views, an Amphitheatre of deep forest valleys and the mountains surrounding Knysna. 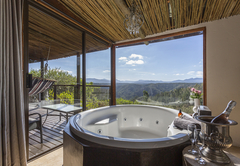 Sip champagne, light some candles and enjoy the bath goodies offered, a deck high up with a weber BBQ and hammock, completes the relaxed enjoyment. 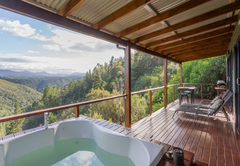 Earth Rose is our deluxe honeymooner, has a big Jacuzzi / tub comfortable for x2 and perhaps a little one, enclosed on the deck, his and hers showers, well-equipped open-plan kitchen complete with microwave, mini stove, fridge etc, lovely deck with hammock and BBQ. 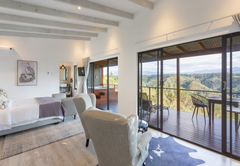 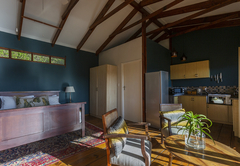 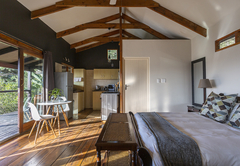 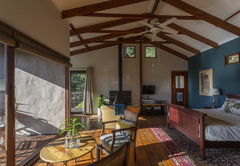 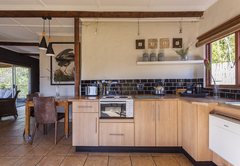 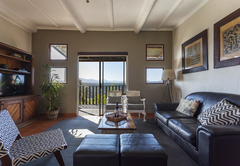 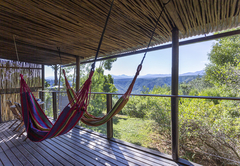 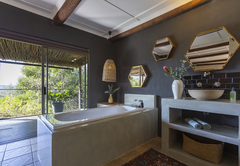 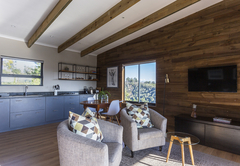 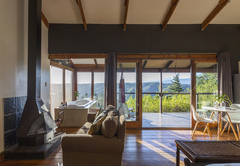 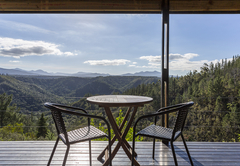 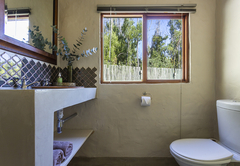 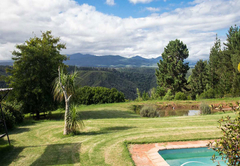 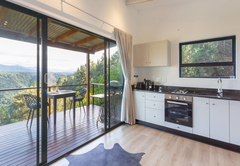 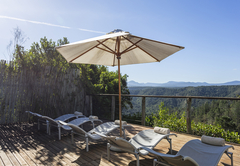 Lavender Edge is another two bedroom unit and has a bath with a view, of deep Forest Valleys and the mountains surrounding Knysna, a big deck, hammock, Webber, breakfast table / seating area and a private outside shower, where the views are super, as well as a shower inside. 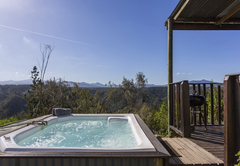 Our latest unit Blue-Sky is just stunning, with unspoiled expansive views, it has a bigger jacuzzi-spa bath off the deck, a view shower and queen-size bed, with an air-con / cooler / heater. 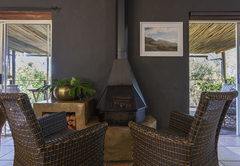 Most cottages have a wood-burning fireplace, for cozy wintry nights, DSTV and CD. 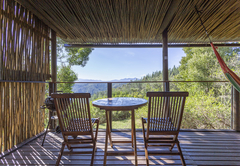 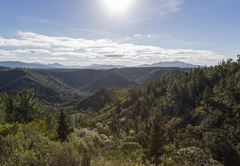 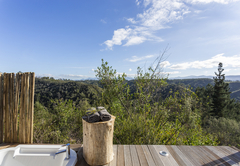 All units have BBQ / braai’s or Webers on the deck high up, from where you can enjoy your partner and the forest, night animal calls, soaking in the sweeping views and crisp clean air. 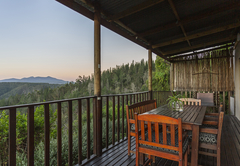 All the decks are very private and are equipped with a table and chairs. 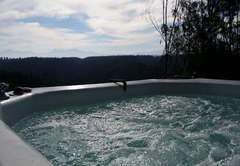 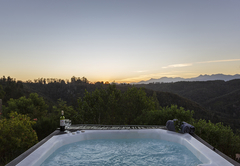 There is a plunge pool, which overlooks the magnificent views, for the use of all the guests. 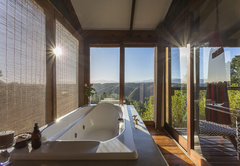 It's like a big Jacuzzi with aim flow jets and seating all around. 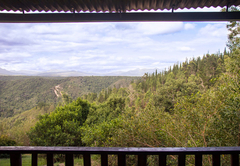 And for the more active there is a forest trail from the cottages to the bottom of the valley. 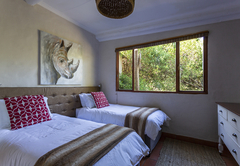 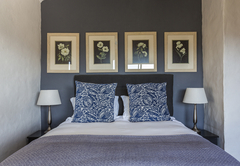 When you book in you will find, we have set up the cottage beautifully for you, with petals on the bed, arrival tea+coffee / small chocolates / bath goodies / candles / some toilet stuff / firewood + charcoal with firelighters on the deck that you can buy / daily housekeeping service /some Dstv / DVD / music system. 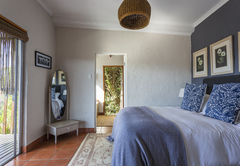 Professional housekeepers will enter from around 10h00 or so, tidy beds, wash dishes, clean Webbers/BBQ’s / fireplaces and freshen up. 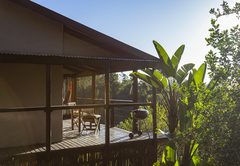 Forest Valley Cottages has a tourist info board, in the office, with pamphlets to take and many things to do in the area, tree-top canopy tours, Elephant Park, Bungy jumping, ferry and yacht cruises on the lagoon, game park visits, horse riding, visit gold mines of the 1800 close-by…are but a few. 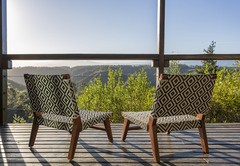 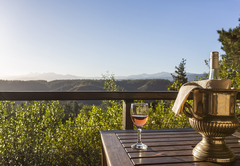 • Start your day in a languid fashion, lazing on the deck chairs or enjoying breakfast, which you can order from Forest Valley Cottages, on the sunny decks, drinking in the awesome views that stretch on forever in front of you. 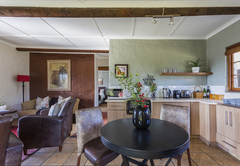 The valley is ever-changing in its moods, thus close-by Phantom Pass, a Khoi bushman word for the changing sites. 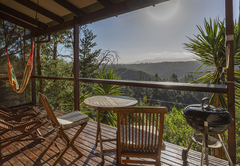 • Enjoy a forest hike from your cottage, down into the valley (about 1.5hrs) or do the many hikes in the Knysna Forest 7kms away. 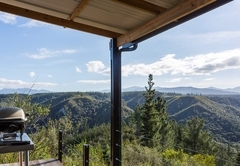 World class MTB tracks and area. 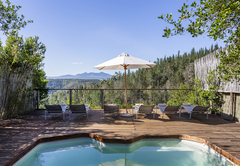 go to the pristine Buffalo Bay swimming beaches for safe swimming…15mins away, by car! 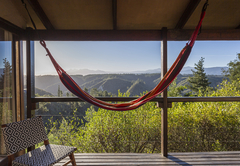 Then return to your secluded cocoon of comfort, light a fire, open a bottle of good red wine and gaze at the stars and listen to the night sounds. 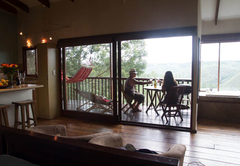 Although we were quite late we had very warm and friendly welcome by Mark. 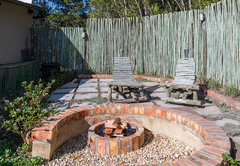 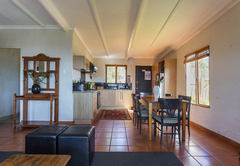 He also gave us some helpful advice where to find good food  Our cottage is nicely situated in the woods but still in close enough to Knysna to allow daytrips. 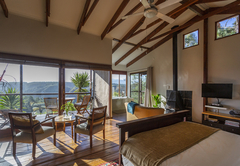 It was clean and cozy and has a breathtaking view from the veranda . 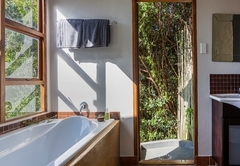 Our favorite was the outdoor shower. 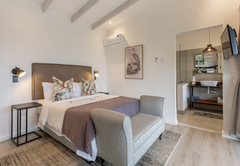 We highly recommend a stay at the Lavender Cottage . 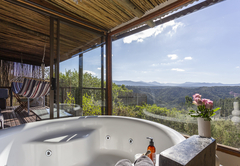 Thank you, Baie dankie vir ‘n wonderlike 3 dae van honeymoon dit was heerlik om daar te wees. 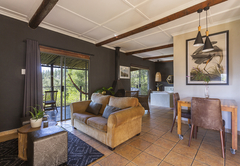 Groete en baie dankie vir die gasvryheid. 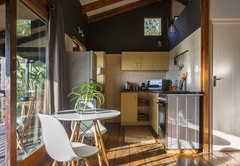 Response timeForest Valley Cottages typically responds to requests in 5-10 minutes.